Around two years ago one of our customers in the construction industry asked us to make them customized rolls of flashing tapes. Designed to seal around openings and penetrations in exterior walls, these tapes had to be slit and rewound, allowing us to demonstrate our machine building knowledge and skills. We are veteran converters and toll manufacturers, and our design engineers and slitter supervisor knew exactly what to do. Essentially, our conventional geometric slitter had to be reworked to accommodate the final core sizes as specified by the customer. After slitting, we had to rewind the flashing tapes from 75' long X 36" wide rolls of flashing tape on 4" cores, to rolls 10' long X 4" wide on 1 ½" cores. Using 4" cores on a 3" shaft with easy on-and-off capabilities, we accomplished this process in only 20 minutes, clearly demonstrating the quick change over features of our equipment. 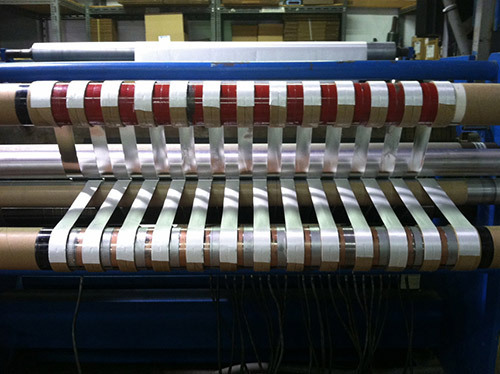 These slit and rewound rolls of flashing tape were processed to a width tolerance of only ± 1/8", after which visual checks verified that final measurements were maintained according to the customer's requirements. We labeled the rolls of tape and shipped them to our client in New England in only one month. Our client must be satisfied - we have now been supplying them with the flashing tape for two years. Pocono Coated Products thrives on this kind of conversion and toll manufacturing project to the point that we will even modify our own equipment as required to produce a satisfied customer. For more on our skills, contact Pocono Coated Products today. 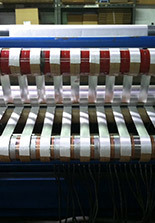 Rewind flashing tapes from 75' rolls on 4" cores 36" wide into tapes 4" wide by 10' on 1 ½" cores on conventional slitter.